(Bloomberg Opinion) -- Not all It Bags are equally alluring. LVMH on Tuesday reported fourth-quarter sales that beat analysts’ estimates. 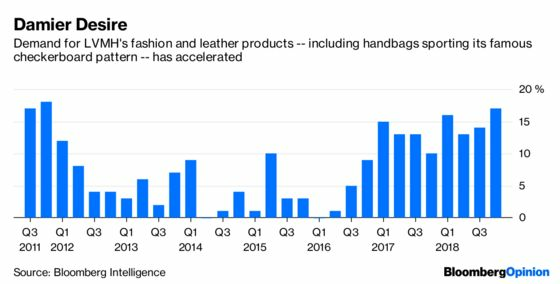 Fashion and leather goods were spectacular: Organic growth was 17 percent, compared with forecasts of 10.5 percent. This gets the luxury reporting season off to a surprisingly good start. But don’t expect all purveyors of high-end goods to follow the same trend. In this environment, the big groups should continue to prosper, but life can be a lot harder for most of the rest. LVMH has scale and diversification. Brands such as Louis Vuitton and Christian Dior have enduring appeal, while Celine and Bulgari have the potential to expand. And, not only can the group afford to back its names with considerable financial resources, it’s willing to spend: Advertising and promotional costs rose 14 percent in 2018. There is no doubt that the outlook is darkening. 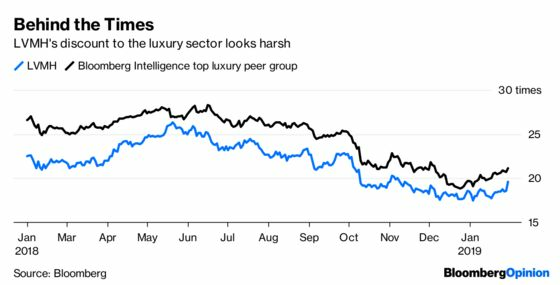 Although LVMH said growth in China accelerated in the final quarter, there are increasing signs that consumers there, who account for about a third of all luxury goods sales, are becoming more cautious. A mixed U.S. retail holiday performance also raises questions about whether American shoppers can keep on spending at the rate they have been since their incomes were boosted by tax cuts. Kering SA also has scale given its range of well-known brands, including Balenciaga. A standout is Gucci, which has been particularly popular in China. While some sales slowdown from the brand’s exceptional levels is likely, it should continue to deliver for a while longer. Hermes International is, as ever, a special case. It has proven its ability to manage demand as well as iconic products. However, a difficult market is likely to be more challenging for some single-brand companies, or those that are trying to reposition their businesses, such as Burberry Plc. Salvatore Ferragamo illustrates the point: On Tuesday it reported sales growth at constant exchange rates that missed analysts’ expectations. In the watch market, meanwhile, this may be as good as it gets. 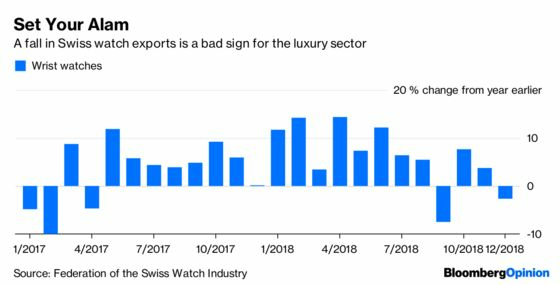 Swiss exports fell in December, led by weakness in China. That’s bad news for Richemont and Swatch Group AG. A less buoyant environment could be a boon for the big groups for another reason. LVMH chairman Bernard Arnault has bemoaned the high prices of potential acquisition targets. With valuations coming down, he may now have an opportunity to strike. Analysts at Berenberg estimate the group could spend up to 25 billion euros ($28.6 billion) on deals, and Kering could spend up to 10 billion euros. Though shares in LVMH rose more than 6 percent, they are still down about 11 percent from their 2018 peak in May. They trade on a forward price earnings ratio of 19.7 times, a discount to the average 21.1 times for the Bloomberg Intelligence index of top global peers. That looks harsh. Given concerns over the Chinese consumer, the forthcoming new year could be a pig in nature as well as name for many in the luxury industry. LVMH and its mega-bling competitors will be better able to cope than most.